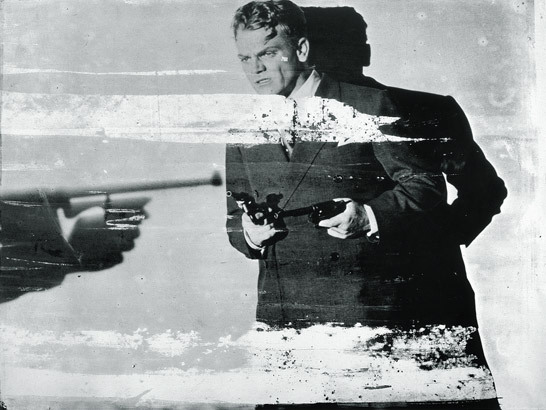 One of Andy Warhol‘s cinematic homages, is this representation of James Cagney, the ultimate Hollywood public enemy badass. Cagney in The UBS Art Collection was printed in 1962 and is based on a still from the film The Public Enemy (1931). Cagney is shown with his back against a wall, moments before his violent death. Later on, Warhol’s Factory produced a large number of silkscreen works, including subtle variations of the same images. thus revealing both the public fascination with celebrity and anti-hero, and the dark appeal of crime in American culture. Image details below. All rights go to the UBS Art Collection. Share it if you like it! & Feel free to email me your ideas! Acrylic and silkscreen ink on canvas. this is a still from Angels with Dirty Faces (1938), not The Public Enemy. Also, the protagonist in Angels with Dirty Faces died later in the film in an electric chair, not in a shoot out.